Naxos villages are a delight for all visitors, as they offer Cycladic charm, lovely architecture and some of the friendliest people in Greece. While staying on the island we strongly recommend spending a couple days touring the Naxos villages and exploring the less known areas of the island. Naxos Town (Chora), the capital of the island is one of the loveliest towns in the Cyclades Cluster. It is a harmonious fusion of traditional and modern features, as small whitewashed buildings have been transformed into clubs, cafes, restaurants, boutiques and shops. Naxos Town abounds with both luxury and budget accommodation, hotels, studios, apartments and rooms for rent. The capital town is the best place to start your tour of the island. While in Naxos Town, you should visit the "Portara" (the Gate of the unfinished Temple of Apollo), the Venetian Castle, the Ancient Site in the area of Grotto and the Museums. We recommend spending a morning just strolling through the town to soak up its charming ambience. 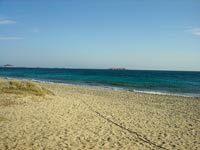 Near Naxos Town visitors are offered a wonderful selection of beaches that are organized and offer tourist facilities. Agios Georgios Beach is one of the Naxos Town beaches featuring a variety accommodation types at close proximity to its golden beach and its crystal clear waters. 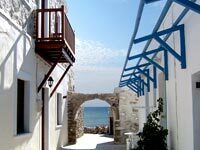 Agia Anna village is a popular seaside resort on the western side of Naxos, south of the capital. The village has plenty of hotels, apartments and rooms for rent, as well as a number of cafes and tavernas by the sea. Agia Anna Beach is one of the most frequented Naxos beaches, due to its fine sand, green cedar trees and organized facilities. 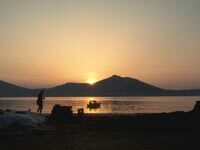 Situated at close proximity to the capital town of Naxos is the peaceful coastal village of Stelida. The settlement lies on Stelida Bay and offers an excellent sea view and a beautiful sandy beach. Stelida provides visitors with comfortable hotels, rooms for rent, studios and apartments, while it is also located close to the villages and beaches of Agios Prokopios and Agia Anna. The village of Agios Prokopios is a favorite holiday destination and one of the most cosmopolitan Naxos villages. It has a splendid sandy beach with sparkling waters that are ideal for water sports and swimming. Hotels, studios, apartments and rooms for rent are abundant in Agios Prokopios, offering accommodation for all types of visitors. The village of Agios Arsenios, situated on the western side of Naxos, is a peaceful inland settlement. The village is built just a few kilometres from the resorts of Agia Anna and Agios Prokopios, offering easy access to two of the best beaches on Naxos Island. Quite a few visitors prefer to stay in Agios Arsenios rather than the seaside villages, due to its serene environment and variety of quality hotels, apartments and rooms for rent. Apirathos is a stunning mountain village, resting in the center of Naxos Island, with traditional, stone-brick houses, lovely squares and narrow, marble-paved streets. It is considered the most attractive Naxos mountain village, as it retains many of the customs and the dialect of its ancestors. Apirathos is host to three museums and the impressive Zevgoli Tower. Situated on the northeastern side of Naxos is the charming fishing village of Apollonas. It is one of the most popular Naxos villages, with a good selection of hotels, apartments, rooms and studios for rent, as well as traditional fishing tavernas and quaint cafes on the beachfront. The superb Apollonas Beach is a mixture of pebbles and sand. The village of Apollonas is famous for its Kouros of Apollo, which is set at the entrance of the settlement. If you ask any of the locals where the best place is to go for a meal or a coffee in a relaxing environment, they will tell you Filoti village. It lies on the slope of Mt. Za, at an altitude of 400 meters, on a lush hillside with stone-paved streets and white island-style houses. 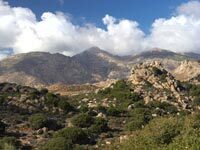 In Filoti, we also suggest visiting the Cave of Za, the Ancient Tower of Chimarros and the Tower of Barotsi. If you are a nature lover, Melanes village should definitely be on your itinerary during your stay on Naxos Island. Its natural beauty is the reason why, for many locals and visitors, it is the most attractive Naxos village. Its verdant valley, fruit trees and running waters create a breathtaking setting. While in Melanes, it is worth visiting the Venetian Towers and the Kouros in the Flerio area. The settlement of Plaka, situated on the western coast of Naxos, south of Naxos Town (Chora), is a fabulous seaside holiday spot. It rests on a charming bay and has a wonderful beach with soft, white sand and provides a number of nightlife and dining venues. Plaka offers a wide selection of hotels, studios, rooms for rent, as well as an organized and modern camping site.